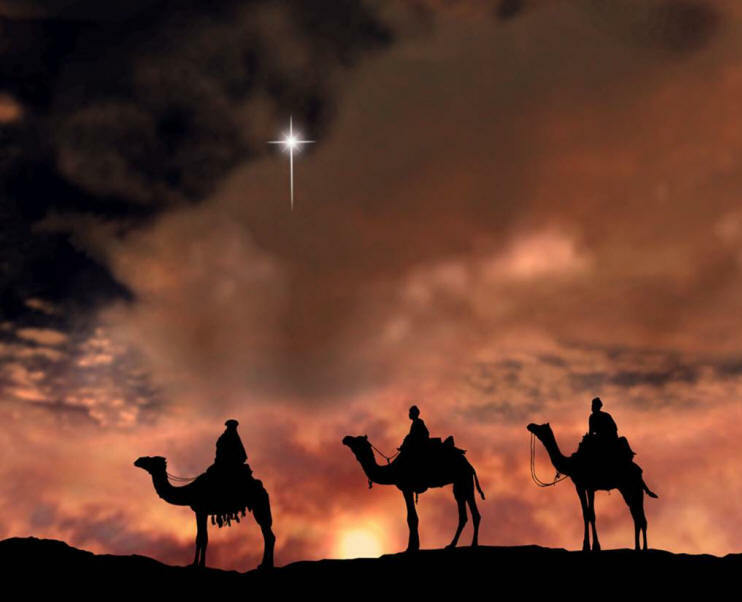 On their way the wisemen saw the same star they had seen in the East. When they saw it, how happy they were, what joy was theirs! It went ahead of them until it stopped over the place where the child was. 11 They went into the house, and when they saw the child with his mother Mary, they knelt down and worshiped him. They brought out their gifts of gold, frankincense, and myrrh, and presented them to him. Two people settle into their seats at the Performing Arts Theatre. She can hardly wait for the concert to begin. He can't wait until it's over! The violins lift her right out of this world. The violins wouldn't move him anywhere except outside! A family is listening to music at home. In one room the young people listen to music that is loud and heavy with lots of shouting by the singers. Mum and Dad, who find this type of music quite unnerving, prefer the gentler, softer sounds that soothe and relax. It’s clear that different people see and appreciate different things. Have you ever been to the art gallery and observed first hand a painting that is all blobs and strokes and splashes, it is absolutely repulsive to you, and you are convinced that the people at the art gallery have been fooled into thinking that this mess of colour is a great piece of art? But then along comes another person who is awestruck as he/she admires this same painting - it is truly the work of a master. You can't see it, but the other person can! Today we come to that part of the Christmas story where this kind of thing happens. King Herod sees the Christ-child in a totally different way to everyone else we encounter in the events of the first Christmas. Herod was a great king, fearless and strong, who had brought order out of chaos in his kingdom through some ruthless means. He had harbours and cities and the temple rebuilt. He built new cities with amphitheatres, a water supply for Jerusalem, imported grain from Egypt and started an aid program during a drought, reduced taxes by a third. He became known as Herod the Great. For all the good he did there was also a dark side to Herod. He murdered anyone whom he perceived to be a threat to his authority. Among his victims were his wife, his three sons, his mother-in-law, his brother-in-law, his uncle - to name just a few. He married his niece to make sure his crown was secure. So it comes as no surprise that Herod would see the news of a rival king as a threat even though this new king is still only a baby. Jealousy has a strange way of twisting reality. When we normally think of a baby we are extremely happy that this new little one has come into our lives. No one would even dream of causing any harm to someone so tiny and helpless. from now until the end of time" (Isaiah 9:7). He only saw this new born king as a threat and so he baited a trap, smiling as he used the sugary words of hypocrisy. He said to the wisemen, "Go and make a careful search for the child. As soon as you find him, report to me, so that I too may go and worship him." (Matthew 2:8). The wisemen saw this new born king with totally different eyes. They had studied the ancient writings, and even though they themselves may not have been Jews, they believed that the bright star in the sky hailed the birth of the king of the Jews. They were well aware of the Jewish expectation of a Messiah, and of the reference in the Hebrew Scriptures that "a star will arise out of Jacob" (Numbers 24.17). They were curious and excited. Though it meant a long journey with many dangers, they decided to visit the new born king. Matthew tells us, "They went into the house, and when they saw the child with his mother Mary, they knelt down and worshiped him. They brought out their gifts of gold, frankincense, and myrrh, and presented them to him." (Matthew 2:11). Take note of the two different reactions to the birth of the Messiah. Herod is fearful, jealous, hypocritical and murderous. Not this child, not even God himself will stand in his way. He must get rid of this child and so orders the massacre of the children of Bethlehem – children who had no connection to Jesus except they were born in the same place and about the same time. On the other hand, the wisemen were happy, eager, loving. They brought gifts of gold, frankincense and myrrh, gifts fit for a king. Even though they were learned and wealthy men they kneel before this baby and worship him as their Lord and king. It depends on who is being asked that question. For one person he is a part of a legend. A person who taught good morals. For another, he is the one you call on when all else fails. Why not try a little prayer? It might just work. To another, he is the God you hold in awe; someone you obey out of fear. To some, he is a good buddy, someone who wouldn’t take your mistakes – your sin – too seriously. And if you asked some, "Who is Jesus Christ?" you would draw a complete blank. They don’t have a clue. Who is Jesus Christ? Ask Herod and he would tell you that he was one king too many. Kill him is the best way to deal with him. He will be our ruler. He will be called, "Wonderful Counsellor,"
"Mighty God," "Eternal Father," "Prince of Peace." This child is worthy of honour and praise and so the wisemen do what Herod would never do – they kneel before him and worship him. Some still respond with hostility. They may like Christmas, but they are offended at any suggestion that the coming of Jesus has any meaning beyond Christmas or any bearing on how they should live their lives. They refuse to believe that Christ came to be their Saviour. His grace, forgiveness and presence are unneeded and irrelevant. How are we to respond? Maybe we can find an answer in today’s celebration of the Epiphany of our Lord. Everyone knows what Christmas is but mention the word ‘epiphany’ and ask people what it’s all about and most likely you will get blank faces. The word Epiphany means "disclosure or revelation or unveiling", and the purpose of the festival is to celebrate not just the event of Jesus’ birth, but what it actually means for the world; what its significance and importance is for us. This is exactly what Paul was talking about in the reading from Ephesians 3 – the revelation or unveiling of God’s great plan for the redemption of the whole world. This is more than just the Bethlehem story. This is more than shepherds and angels and the manger and the star in the East. Epiphany is the whole unfolding of God’s wonderful plan of salvation through Jesus, including the baptism of Jesus (that we will celebrate next Sunday), his miracles, his healings, his teaching, his cross and his resurrection, and importantly, his ascension. Paul talks about a secret plan that God has talked about for generations through his prophets and now the apostles. Jesus is the key to understanding God’s plan. The arrival of God’s Son in the world as a human being is the key that unlocks and reveals, makes clear and explains the whole mystery of God’s plan that has been unfolding ever since the dawn of creation. The birth of Jesus is the great epiphany – the last piece in the jigsaw you might say. Suddenly all that has been said about the Messiah falls into place. The veil that has been hiding God's plan has now been lifted and those who want to look beyond it will see the love and grace of God. Jesus is God's gift to all people – no one is excluded. Unfortunately the only thing some people are interested in is Christmas and they never move on from Bethlehem. Epiphany takes us further than Bethlehem. It doesn’t leave us at the manger. It takes us also to the cross, where our sins were paid for once and for all. It takes us to the empty tomb where Jesus Christ rose to give eternal life to all people. It takes us – each of us – to the place of our "second birth", to the baptismal font, where Jesus makes his forgiveness and salvation ours. One carol lifts the veil that covers the mystery of Jesus’ birth. As we look past the manger we see that Jesus was "born that man no more may die, born to raise the sons of earth: born to give them second birth". And this is where Epiphany happens in each of our lives. This is where the manger and the cross and the empty tomb all converge to bring newness, change, compassion, forgiveness, peace, confidence, hope and joy into our lives. Epiphany takes us beyond Christmas to see that God's plan includes more than shepherds and wisemen but each of us. He reveals his plan to forgive and renew and recreate us for this life and the next. every time we open and read and hear his Word, he reveals his plan again to us. He calls us to carry on his work so that as many people as possible are in some way touched by his love and come to see him as more than a baby in a manger but also their Lord and Saviour. You might say we are God's epiphany messengers lifting the veil and revealing to others who Jesus is and what he done for them. As in the gospel reading people react to Jesus differently. He comes with love bringing forgiveness and eternal life, offering to walk with us and help us throughout our life’s journey. We can leave him in a manger and pack him away with all the Christmas decorations or welcome him into our hearts and lives and to experience his love, to trust him as our Saviour, to know we are his children, to live for him, to pass on his love to others while all the time knowing that he lives within us!